Pink Exploded in My House! When you have three boys, and you are expecting a little girl this is what happens at my house a pink explosion. 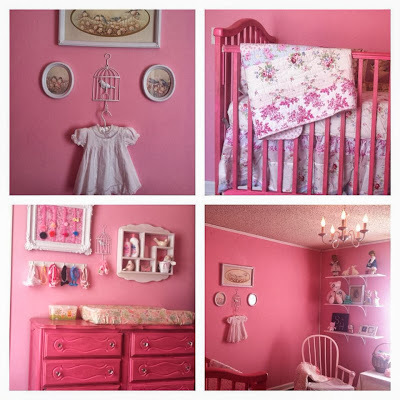 I end up with an all pink nursery for our itty bitty. I admit that I am in love with this simply yet super girly room in my house! I have to give a giant shout out to my parents who help in a big way. My mom did all the painting which is not the most fun job in the world, and my dad painted then hung the chandler adding a dimmer switch to the room! Thanks parentals!